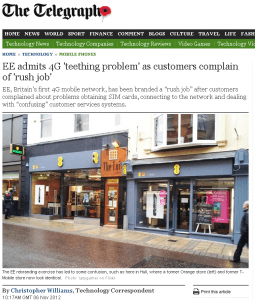 I have a real-life case study on what it is like to be a technology influencer thanks to some process issues from the new 4G network operator, EE that I encountered back in November 2012. Full disclosure: I am now happy to say that as of Monday night, 5th November 2012, I now have a working SIM card from EE and am enjoying blistering fast 4G mobile broadband speeds all over London. I’m a happy customer again. It did take nearly a week to get it sorted, and my blog post about my experience probably helped somewhat in getting the attention of EE – while also attracting the attention of the mainstream media. Chris Williams, the technology writer for the Telegraph contacted me on Monday afternoon after seeing my blog post. He published a story on Tuesday about the issues I encountered, as well as issues reported by other customers. So the question remains, how did this story about few process issues make the mainstream media? Simple – social media influence. Now I’m not trying to big-note myself, I am not a celebrity and I run this blog as a hobby and as an outlet for my writing, but I was able to capture the concern from other EE users about issues they were experiencing and highlight them here to a wide and influential audience. UPDATE: 14th December 2012 – I’ve developed an advocate program for EE – read about it at lc.tl/advocates – this should help pinpoint these problems in a more timely fashion and provide direct feedback to EE. This snowballed from Saturday night when I posted the article right through until this morning. As a result, I have been in constant contact with the EE technical and PR people, and they are now being very responsive and are diligently fixing the issues reported here and by other customers. I am meeting some senior EE folks tomorrow at EE HQ to provide some feedback on my experiences, and as I run Kred, will be giving them some tips on how to be a social business (or move towards one) and also from personal and professional experience how to deal with influencers before, during and after a big launch like this. What could EE have done differently? Be aware of the key technology and social media influencers before launch and get them on board early. When a story like this breaks, you want them to come to your defence. Free tools like Kred (disclosure, I am CEO of Kred) help here, as well as paid tools. Establish an ambassador program. With all that mobile speed, key bloggers are dying to get their hands on a 4G network and blog about it. EE will recover from this, and I hope to play a small part in this when I meet with them on Wednesday. Stay tuned for the next chapter, and don’t ever think influencers can’t help or hurt a launch. If engaged in a transparent and meaningful way, social media influencers can be even more powerful and helpful than celebrities given the product or service for free. See a post on this titled “do we need celebrity endorsements in the age of the influencer”. My point here is that influencers such as myself actually pay for these services, and it is our brand at risk if we recommend something that is not quite ready. On the other hand, celebrities get the product name out there fast, but often have no real connection or passion for the brand. James – this is a great case study, and I look forward to presenting it to the Ogilvy team sometime soon – lots to learn from this. I’m in at Ogilvy on March 7 doing the breakfast briefing – will present this as one ot the things I speak about.